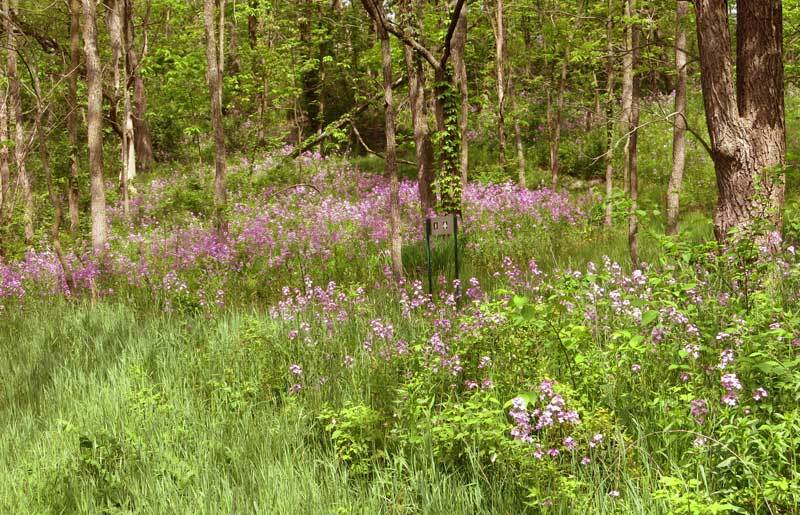 Should colorful invasive plants be controlled? 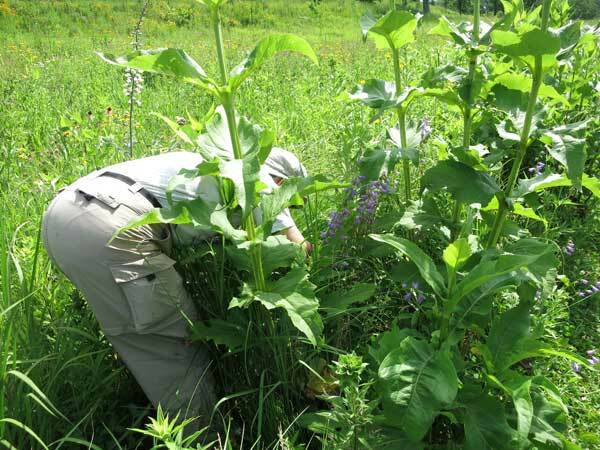 Many of the invasive plants that we deal with in restoration ecology are rather unremarkable in appearance, so one doesn’t mind getting rid of them. But there are also invasive plants that are colorfully attractive and there may be a temptation to let them be. Two species in this category are dame’s rocket (Hesperis matronalis) and creeping bellflower (Campanula rapunculoides). Both are decorative and would appear to be welcome additions to a native garden or prairie. But they aren’t, and should be eradicated. Fortunately, because these two species are colorful, they are easy to spot. It would be an embarrassment to have a whole field of one of these plants. Although this plant is often mistaken for a woodland phlox, it is really a mustard (note the 4 petals). Like garlic mustard, it is often found in wooded areas, but it also invades open areas such as roadsides. This is one of those species that is often included in seed packets labeled “wildflowers”. To many people, “wildflower” implies “native”, but this species was introduced from Europe in the 1600s and is highly invasive. Like garlic mustard, dame’s rocket is a biennial, and this gives a clue to control methods. The number one point is not to let it set seed. Cut the flower heads off or hand pull the plants before seed formation. Like garlic mustard, bag flowering plants, because even pulled plants can go on to make viable seeds. In contrast with garlic mustard, colorful dame’s rocket is very easy to spot. With care, it should be possible to eradicate dame’s rocket from a site. University of Wisconsin-Extension has a good flyer on dame's rocket, available at this link. Creeping bellflower is a perennial which spreads rapidly via rhizomes. It has the potential to form large clones. Its rhizomes can be up to 6” deep, with vertical storage roots. If cut or mowed, the plant will readily regenerate from rhizomes or perennial roots. The number one point is do not let it get started, because once established it is very difficult to eradicate. Large patches can be sprayed with glyphosate or an herbicide labeled for broad-leaf species. I should emphasize that creeping bellflower is a very undesirable plant, despite its colorful character. University of Wisconsin Extension has a good flyer on creeping bellflower, available at this link. After the above post was made, we discovered two small populations of creeping bellflower in the Valley Prairie at Pleasant Valley Conservancy. They were immediately killed using our standard Garlon 4 in oil spritz technique. This involves finding the lower part of the plant with the bare stem and basal leaves, and spritz both. Within a week they were dead. Kathie exhuming the base of each creeping bellflower stem and spritzing with Garlon 4 in oil. Five or six individual stems growing out of a cup plant patch. 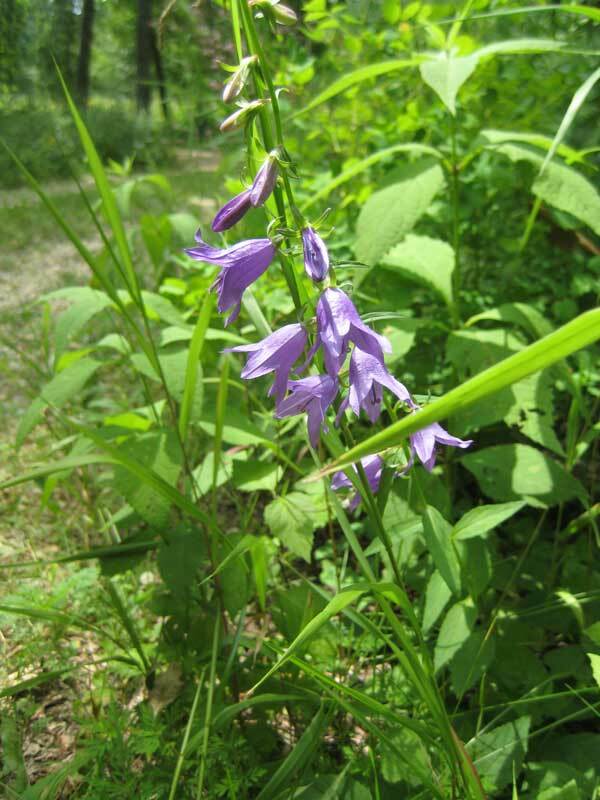 There are two “native” species of Campanula which are attractive and desirable in a restoration. Harebell (C. rotundifolia) is a small, delicate perennial that is found individually or in small patches in dry or rocky habitats where it is free from competition from larger species. 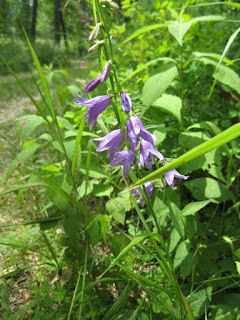 American bellflower (C. Americana) is an annual or biennial that reproduces exclusively from seed and is found scattered in wooded or savanna areas. Shooting star: prairie or savanna plant? This is shooting star (Dodecatheon meadia) time. At Pleasant Valley Conservancy, we had many sites where this species was remnant. Some even flowered before any restoration work, but lots had also been suffering along in deep shade and only flourished after brush clearing and a burn. Of course, we also collected seeds and used those to plant prairies in our former ag fields. Shooting star is one of those species (like golden Alexanders and New Jersey tea) that do well in both prairies and savannas. There has been some good research on the growth and cultivation of shooting star, most importantly the nice paper by Paul Sorenson that was published in one of the North American Prairie Conference reports. 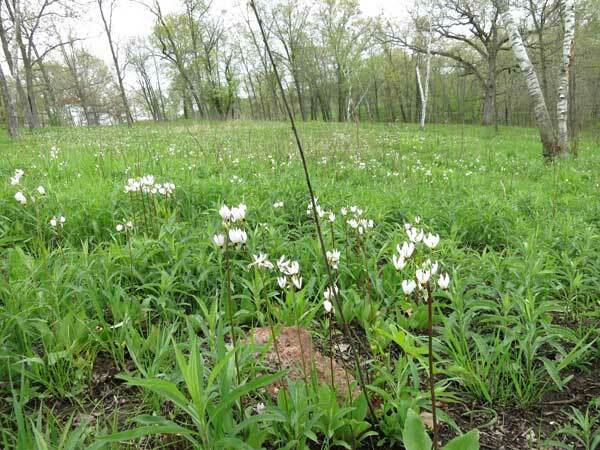 Right now you should find shooting star in bloom in almost every prairie or savanna in southern Wisconsin.